Nihon Superior Co. Ltd will exhibit in Booth #1019 at IPC APEX EXPO 2018, scheduled to take place Feb.27-Mar.1, 2018 at the San Diego Convention Center in California. The company will introduce the new SN100CV P608 D4 solder paste and NS-F851 rosin-based flux, and show the ALUSAC-35 alloy and Alconano Nano-Silver paste. SN100CV P608 D4 is a completely halogen free, lead-free, no-clean solder paste. Unlike silver-containing alloys that derive their strength from a dispersion of fine particles of eutectic Ag3Sn, SN100CV gains its strength from solute atoms in the tin matrix of the joint. The paste provides excellent wetting and reduces voiding. The company also plans to introduce NS-F851 – the improved version of the NS-F850 rosin-based flux for lead-free wave soldering. The new, no-clean flux ensures excellent wetting of all PCB and component substrates to deliver maximum through-hole fill and facilitates the solder drainage that ensures minimum bridges and icicles. It is the ideal flux for lead-free wave soldering. Additionally, the rosin-based flux ensures that the full reliability potential of SN100C lead-free solder is realized. ALUSAC-35 is a lead-free alloy designed for soldering aluminum. Despite the cost and the performance advantages of aluminum, its commercial adoption has been slow because of the concern about the galvanic corrosion that results from differences in the electrical potential of the constituent phases. Joints to aluminum made with this new alloy retain reasonable strength even after 30 days of saltwater immersion. Alconano Nano-Silver Paste is based on a patented technology that makes it possible to effectively join most metals as well as Si and SiC at low sintering temperatures, if necessary in nitrogen, without the nitrous or sulphurous residues that are the by-products of the sintering of some other nano-silver pastes. The highly active surface of the nano-silver particles and the consequent strong capillary forces make it possible to achieve strong bonds even on copper with high electrical and thermal conductivity at low temperatures without the need for external pressure. 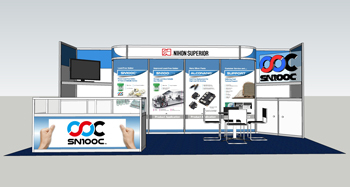 For more information about Nihon Superior’s new products, meet company representatives in Booth #1019 at the show.